-1- I arrived home and mentally prepared myself for the events to come. This sounds dramatic, but for an introvert, Halloween is pretty much our worst nightmare. People come unannounced to your door and wait there until you answer and force an interaction with you including an exchange of goods. This happens repeatedly. Then you have to go outside with your unruly children and run into people on the street and make polite small talk with them. A quick dinner ensued, Mike and I having to talk Henry out of putting his costume on an hour before showtime at least a half dozen times. -3- Soon, our doorbell started ringing. Mike usually takes care of handing out candy, and I take the kids out, but this year things weren't so cut and dry. (c) Anne was refusing to go out trick-or-treating. 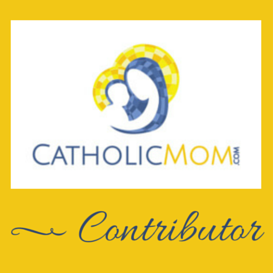 -5- Once a few more kids came to the door, Anne consented to put on her Rapunzel costume. I whipped it right over her clothes in case she changed her mind, but things started to go better from this point forward. Soon, Mike and Henry were back, and since Anne was now agreeable, we decided that I would take them both out trick-or-treating while Mike took over candy duty. We bundled. Mommy mixed herself a vodka...something to put into her water bottle ;-) and off we went, out into the rain. "Yes, I know, sweetie, but it's either get wet or stay home." That seemed to put an end to that issue. -6- For about 6 houses, Anne refused to go to the door, staying on the sidewalk sullenly by my side while Henry went to get candy. But soon she got into the spirit, realizing that her cuteness would garner her quite a haul. Next thing you knew, she was racing up to doorways, patting pumpkins, and getting candy put into her Disney Princess bag. "Mommy, I'm *tirreeedddd!*! Can we go home?!" Now, the 8 year old was coming apart. Because both children are never happy at the exact same time. -7- I forced him to stay out long enough for Anne to get to enjoy a few more houses (and for Mommy to finish her drink...) and we headed home, both children exhausted and happy. Far too much sugar was then consumed at home, Anne running around in her diaper while Henry carefully sorted his candy into categories (the apple doesn't fall far from the tree). Then everyone was given baths and herded into bed. A good time was had by all, and the Catholic Librarian is relieved that she survived this clearly extrovert-created holiday for yet another year. 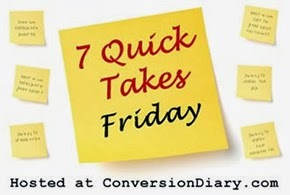 Don't forget to head over to Conversion Diary for more 7 Quick Takes! Have a great weekend, everyone! That picture of the two of them & your commentary are hilarious.